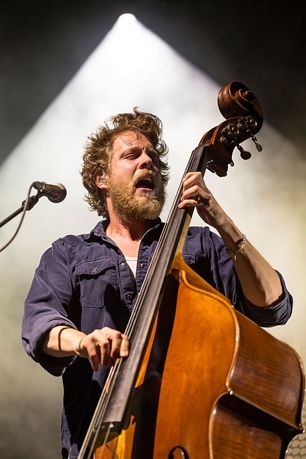 Mumford & Sons bassist Ted Dwane will undergo surgery to remove a blood clot from his brain, forcing the band to cancel three shows scheduled for this week. The English group announced the news in a statement on their website. "Our friend and bandmate Ted has been feeling unwell for a few days, and yesterday he was taken to a hospital to receive emergency treatment," the band wrote. "The scans revealed a blood clot on the surface of his brain that requires an operation. Ted is receiving excellent care and we are being assured that he will recover quickly from surgery. Dwane's emergency surgery means the band won't play shows scheduled for Dallas tonight, the Woodlands, Texas, on Wednesday and New Orleans on Thursday. The band says make-up shows will be scheduled and announced as soon as possible. The tour is expected to resume Saturday at Bonnaroo in Tennessee. "We have no plans to cancel or postpone any other appearances along this current tour," the band wrote. Mumford & Sons are on the road behind last year's album Babel. The group also recently teamed with Elvis Costello to cover Bruce Springsteen's song "The Ghost of Tom Joad" for the One Campaign's agit8 anti-poverty initiative.